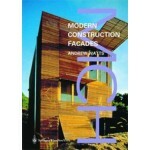 The Facades Handbook is a textbook for practitioners of architecture, as well as structural and environmental engineers who wish to broaden their study beyond the information provided in the 'Walls' chapter of the Modern Construction Handbook. The six chapters examine facades from the standpoint of the primary material used in their construction, from metal to glass, concrete, masonry, plastics and timber. Each set of three double page spreads explains a specific form of construction which is accompanied by drawn and annotated details. Throughout the book, built examples by high profile designers are used to illustrate specific principles. As is the case in the Modern Construction Handbook, the techniques described can be applied internationally.